The clutch assembly consists of a single dry-disc driven plate and a one-piece diaphragm spring-type clutch cover. On Wrangler 4-cylinder models, the clutch cover and driven plate diameter is 9.28"
(232 mm). On Wrangler 6-cylinder models, the clutch cover and driven plate diameter is 10.5" (266 mm). On all other 4 and 6-cylinder models, the clutch cover and driven plate diameter is 9.7"
(246 mm). The clutch is actuated through a hydraulic master cylinder and slave cylinder. On Wrangler models, the slave cylinder is mounted inside the clutch housing. The bearing is permanently attached to the cylinder piston. remove inner boot and gearshift lever. shift lever from stub shaft. reassembly. Disconnect front drive shaft and secure out of way. 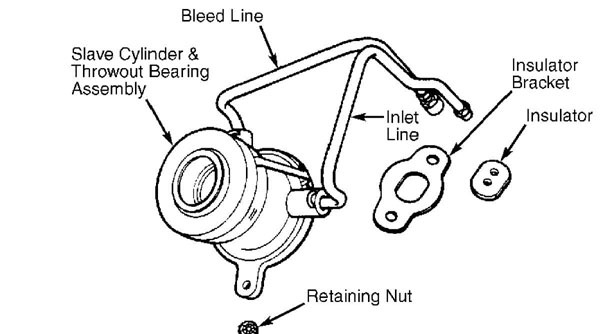 throw-out lever, bearing, and pivot ball from clutch housing. Remove transmission assembly. Mark position of clutch cover on flywheel for reassembly reference. Evenly loosen clutch cover bolts one or 2 turns at a time until clutch cover spring tension is released. Remove cover bolts, clutch cover, and disc. See Fig. 1.
install clutch cover. Be sure marks made during removal are aligned. Wrangler has a one-piece slave cylinder. washer holding cylinder push rod on clutch pedal. clutch master cylinder to studs on dash panel and remove cylinder. and transfer case. Slide rubber insulator off slave cylinder lines. cylinder and bearing by sliding assembly off transmission input shaft. Fig. 2: Wrangler Clutch Slave Cylinder Courtesy of Chrysler Motors. Disconnect hydraulic line at clutch slave cylinder. Cap line to prevent fluid loss. Remove spring holding clutch fork lever to cylinder push rod. Remove bolts attaching slave cylinder to clutch housing. Remove slave cylinder, heat shield, clutch fork pivot, washer and seal. To install, reverse removal procedure. Bleed hydraulic system. Remove clutch assembly. Remove pilot bushing using Slide Hammer (J-2619-01) and Bushing Remover (J-5822). Lubricate replacement bushing with engine oil. Remove pilot bushing lubricating wick and soak wick in engine oil. Install wick in bushing bore. Install bushing using Clutch Pilot Shaft (J-33169) . Keep pilot shaft parallel with crankshaft center line to prevent damage to bushing. Reverse removal procedure to complete installation. dust cover and snap ring. Remove push rod, retaining washer, and seal as an assembly. Discard seal. Remove plunger, valve spring, and valve stem assembly from cylinder bore by tapping cylinder body on wood block. and valve stem from valve spring. NOTE: Retainer tab is located in rectangular slot in side of stem retainer. Fig. 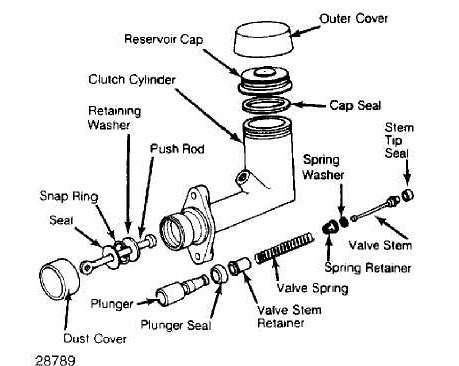 3: Exploded View Of Clutch Master Cylinder Courtesy of Chrysler Motors. plunger seal faces stem end of plunger. Install stem tip seal so seal shoulder fits in undercut at end of valve stem. 2) End of valve stem should pass through stem retainer and seat in small bore in end of plunger. Bend retainer tab downward to lock stem and retainer on plunger. To complete assembly, reverse disassembly procedures. NOTE: On Wrangler models, the integral slave cylinder and throw out bearing assembly is not serviceable. If cylinder, bearing or lines become damaged the entire assembly must be replaced. Clean cylinder exterior. Remove dust boot from cylinder. nicks or scores. Replace if necessary. Fig. 4: Exploded View Of Clutch Slave Cylinder Courtesy of Chrysler Motors. Reverse disassembly procedure. Lubricate cylinder bore and seal with brake fluid before reassembly. release lever as far forward as possible. Attach rubber hose to slave cylinder bleeder screw. Immerse other end of hose in glass container 1/2 full of brake fluid. Loosen bleeder screw and have an assistant depress clutch pedal. Tighten bleeder screw and release pedal. is free of bubbles. DO NOT allow reservoir to run out of fluid during bleeding. Refill clutch master cylinder to level mark on reservoir. (1) - Plus additional 60 degrees turn after reaching torque specification.